The hot summer days are well behind us. The air is getting chilly outside and the thermostats are being turned up. It's tempting to stay in and read a book or watch TV. Yet autumn is a beautiful time of year to enjoy Victoria's great outdoors. So next time the Bureau predicts fine weather, grab a scarf, jumper and a picnic hamper and head out for the day. Some of the best places to visit during autumn won't cost you much more than a tank of petrol. One of my favourite places to escape during autumn is not far from Melbourne and so perfect for a day trip. A relaxing 1 hour drive along the Calder Highway brings you to some delightful country towns in Central Victoria. First stop is Mount Macedon. Most people associate the Macedon region with Hanging Rock. For me the entrance fees and its popularity make this a less than ideal day out. 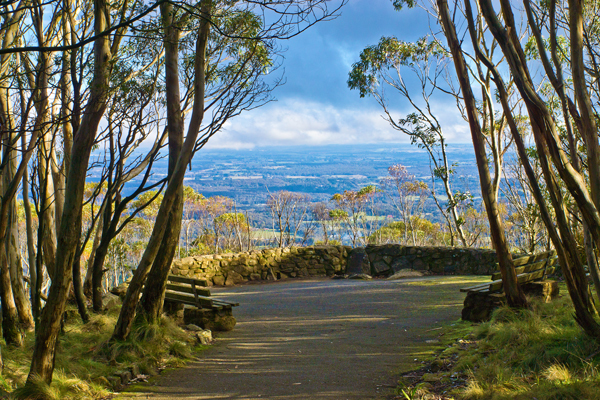 A better option is to head straight up Mount Macedon itself. There are many great walking trails in this wilderness so close to the city. The trails are all clearly marked with distance signposts and start out from picturesque picnic grounds. 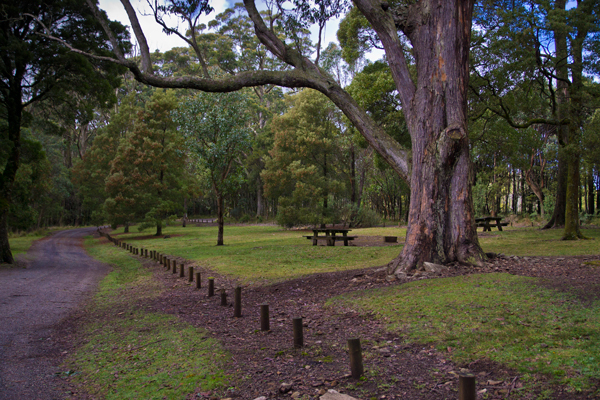 Bring a thermos and cake and stop off for some morning tea, then walk it off on one of the bush tracks. The Giant Cross Anzac Memorial is more than just a great place to honour our war heroes. 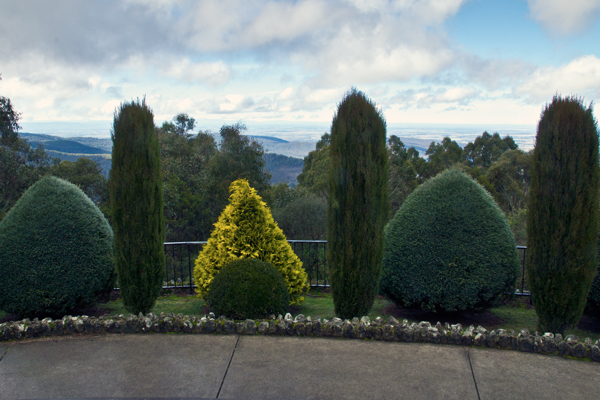 The views over the Macedon ranges from the lookout are breathtaking. The manicured gardens are a colourful backdrop to the often cloudy autumn skies. Kyneton has many original blue stone buildings left over from the gold rush days when it was a popular rest stop for diggers on their way to Bendigo. There are many great cafes, restaurants and antique stores, particularly on Piper Street. The best free place to visit in Kyneton during autumn is also a perfect stop for a picnic lunch. 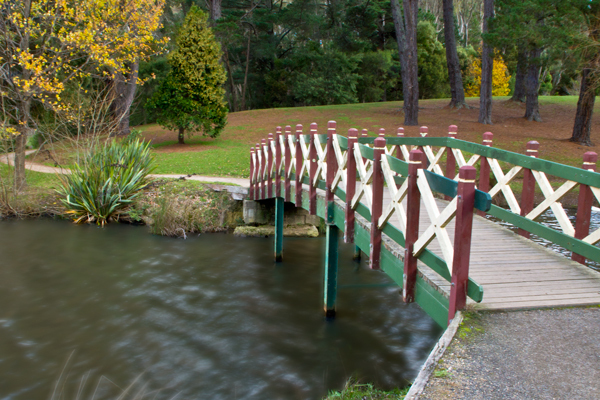 Kyneton Botanic Gardens is located past the railway station on the main road into town.. There are public amenities and picnic tables. After lunch head down the hill to the walking trail that runs along the Campaspe River. The gardens date back to 1858. Many English deciduous trees were planted in the gardens during this era and so they are bursting with colourful autumn foliage.. The Campaspe River makes the perfect scenic backdrop. The path is mostly concrete or boardwalk and quite flat, so is very accessible. A 40 minute drive from Kyneton brings you to your final destination. Daylesford sits atop a volcanic mountain range and is picture perfect at any time of year. However, in autumn Daylesford really shines. 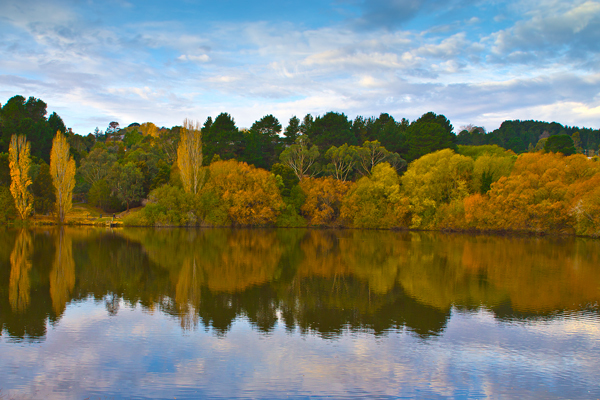 The best way to appreciate the area in autumn is to visit Lake Daylesford. If you are lucky enough to get some sunny breaks during the afternoon the blue water against the autumn trees is like a post card scene. The lake is an ideal stop for afternoon tea. If you've already polished off the contents of your picnic hamper the Bookbarn is handy for a coffee and cake, and you can browse their collection of second hand books. Still feeling energetic? Try the Peace Mile walking track that goes right around the lake. The pretty trail takes you past working pumps where you can pump your own mineral spring water. Be warned, in my opinion it takes a bit like rotten eggs, but many people swear by its therapeutic benefits. There is some gorgeous scenery on this walk so bring your camera. Enjoy your day and don't forget an umbrella in case of rain. Do you know of any other great day trip locations just outside of Melbourne? Feel free to leave a comment! How far is "near"? 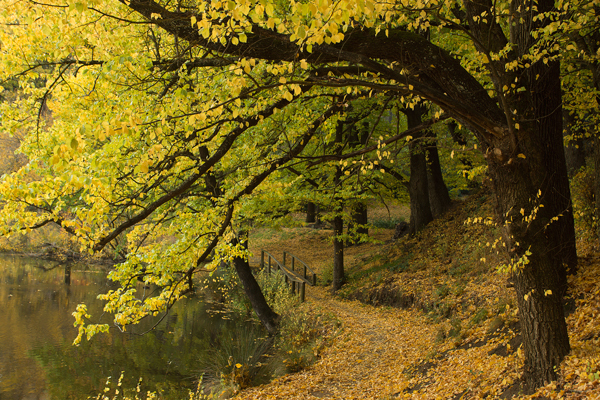 Buninyong, near Ballarat, has had the most exquisite fall of golden leaves, especially in its Botanic Gardens. A solid carpet of gold. 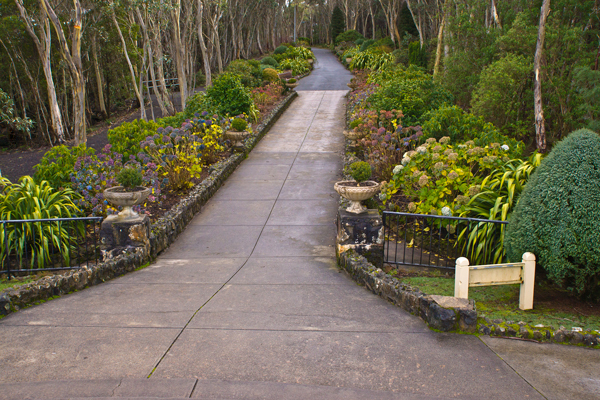 However, Daylesford - especially Wombat Hill Botanic Gardens, above the town - is glorious all year round. And there's the added attraction of a superb cafe, run by the Lakehouse people. Anywhere, where European trees predominate, will be spectacular. I would take a leisurely drive through the country, to the Blackwood Hotel. Have lunch by the open fire. There is an Antique shop to browse in before the return home. The Aqueduct Walk in Warburton is great for walks and cycling - lots of beautiful rainforest to pass through, breathtaking views and friendly people to meet.